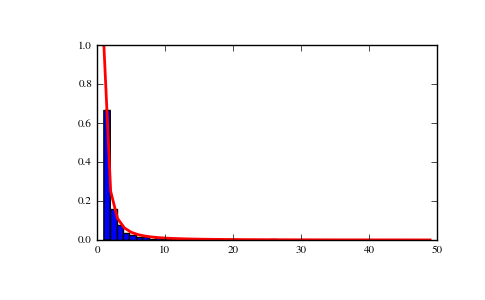 Draw samples from a Zipf distribution. Samples are drawn from a Zipf distribution with specified parameter a > 1. The Zipf distribution (also known as the zeta distribution) is a continuous probability distribution that satisfies Zipf’s law: the frequency of an item is inversely proportional to its rank in a frequency table. Output shape. If the given shape is, e.g., (m, n, k), then m * n * k samples are drawn; a single integer is equivalent in its result to providing a mono-tuple, i.e., a 1-D array of length size is returned. The default is None, in which case a single scalar is returned. The returned samples are greater than or equal to one. probability density function, distribution, or cumulative density function, etc. where is the Riemann Zeta function. It is named for the American linguist George Kingsley Zipf, who noted that the frequency of any word in a sample of a language is inversely proportional to its rank in the frequency table. Zipf, G. K., Selected Studies of the Principle of Relative Frequency in Language, Cambridge, MA: Harvard Univ. Press, 1932.